There is a time in your life when you realize that you will never play for England, you will never get that million dollar signing on bonus and 50,000 fans will never shout your name. And 20 years later there comes the call to play for an invitational British XI against a Cuban team? The award-winning play by young British playwright Joe Penhall, was presented at the Teatro Bertolt Brecht, June 7-10, 2013 as part of British culture week. Directed by British Stephen Bayley and brilliantly performed by the La Peña Meisner de la Habana with two separate casts.? Seven Swinging Days came to a conclusion with the appropriately named Tremendonga Party hosted by Qva Libre at the legendary beer garden where Arsenio tore it up in the 40s. Guest performances by David Blanco, Ernesto Blanco, JG, Luna Manzanares, 0es3 and Djoy de Cuba not to mention a cameo from the British Ambassador ? Last week in Havana we saw a fantastic celebration of British culture. Once a year, as in many other countries in the world, the Embassy organises a BritWeek when we put on a variety of events. In Havana our cinema programme included the Cuban-British film, The Day of the Flowers. Obra Blue/Orange, put on by British director Stephen Bayly and performed by Cuban group La Peña Meisner, gripped and challenged theatre audiences. Music highlights were the +Verde Festival in the Morro-Cabaña and the Tremendonga Party; at both Cuban artists mixed or played British songs. Every night we had a Secret Party in one of the new private restaurants where British cocktails and food were served or music was played. You might be starting to detect an emerging theme here. A lot of the events weren’t simply British but were a mix of British and Cuban culture, a fusion of the two. The Day of the Flowers for example is the story of two Scottish women who take the ashes of their Cuban father back to Cuba – it’s filmed in both Scotland and Cuba and includes Cuban and British actors. Meanwhile, Blue/Orange was written by a British playwright, Joe Penhall, won prizes when first performed in London and has now been translated into Spanish for the performances in Havana (where it deserves to win prizes too). And at the Tremendonga Party, Cuban band Qva Libre sang ‘We will rock you’ to 4,000 adoring fans. 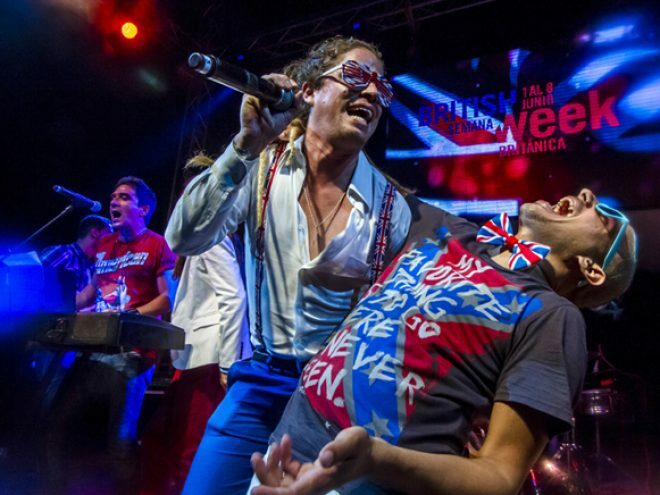 I don’t lay any claim to being a great commentator on culture and I’m sure that reams of newsprint and digital text have been written about the pros and cons of cultural fusion but for me, these events were some of the real highlights of Britweek in Havana. They were intriguing, challenging and amusing. Fascinating and fun; isn’t that what you want from a good slice of culture? You might ask though why we bother with Britweek. It’s a lot of work – a lot of people worked some very long hours in Havana to make sure it was a success – and costs a fair amount of money. These resources – people and money – could have been deployed elsewhere if we hadn’t organised Britweek. It’s a good question and there are two very good answers. The first is that culture is a fantastic way for people to engage with other countries. Through it we learn a lot about the world, about different points of view, about different people. I’ve certainly learned a lot about Cuba through some of the wonderful cultural events I’ve attended since I’ve been here. During Britweek Cubans saw a side of the UK they are not very familiar with; they will have learned that the UK is diverse, modern, creative, open and green. These aren’t qualities they normally associate with the UK (we know, we’ve asked them). Now I hope more of them do. The other reason is that the creative industries are a big part of the British economy – approximately 6% of GDP. The UK is the second biggest exporter of music worldwide, there are over 100 film studios in the UK and a quarter of the world’s video games are produced there. The creative industries sector employs over 2 million people in the UK. It’s a sector that matters to us and matters to Cuba too. Culture isn’t just about going to the theatre or cinema or watching a DVD; it’s jobs, salaries and opportunity. The Day of the Flowers took 7 weeks to shoot in Cuba then 18 months in post-production and involved the employment of about 160 Cubans. That’s good business. And good fusion.